In the February 2014 issue of Popular Woodworking (available online, free!) 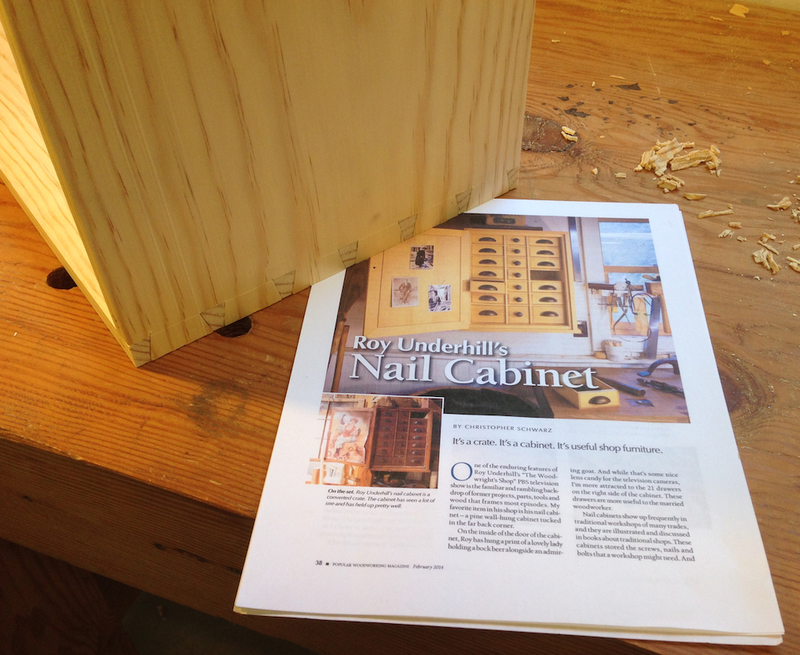 Chris Schwarz contributed an article on Roy Underhill’s nail cabinet. I’ve seen that in the background of every show I’ve watched, but never realized what it was — this is the picture that is on the inside door of the cabinet. Anyway, I had three 1×12 pine boards in the shop and a couple of days before I go back to work, so I decided I’d build it. It’s a little bit of an odd piece. 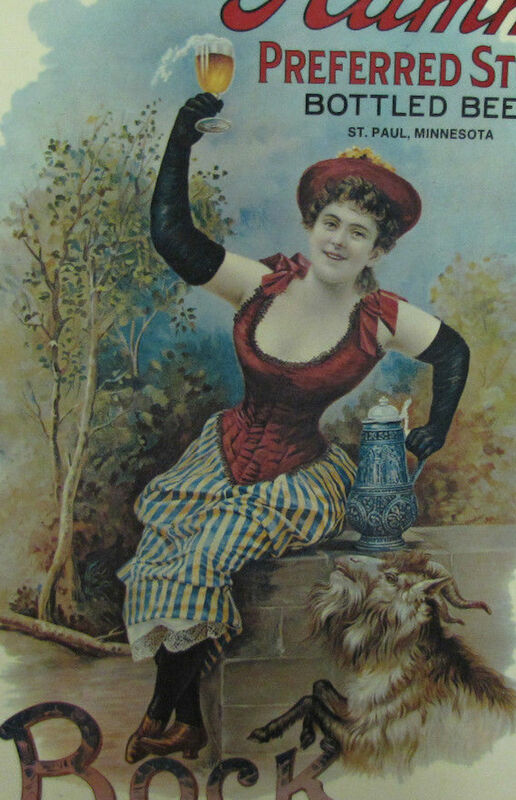 As the story goes, the original was made by some unknown woodworker out of a match crate. The plans reflect that, you basically build a crate, fit it with egg crate dividers and 21 drawers. I wouldn’t have designed it like this…and I almost re-designed it, but instead decided just to build it according to the article. I started by laying out the sides and top/bottom for the carcase on a 1×12. 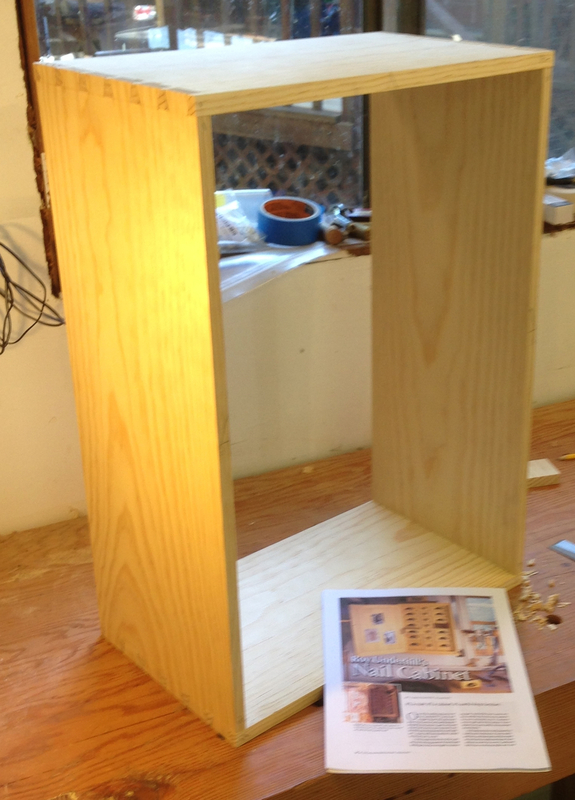 I used my power tools to dimension the parts. I’ve decided I like dimensioning stock with a planer and jointer when I can. It’s fast and efficient and accurate. I planed the sides to 1/2″ (per the instructions), the top and bottom were supposed to be 3/4″ but by the time I got the worst of the cupping out it was a bit over 5/8″. 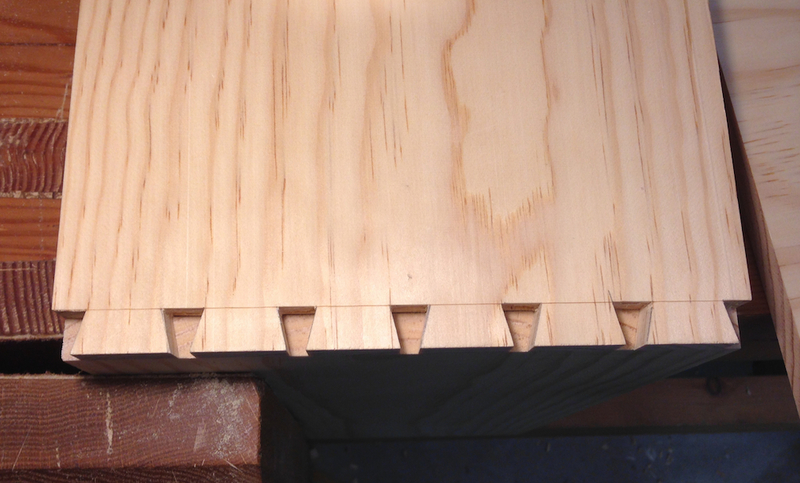 Now I get more dovetail practice, yippee! 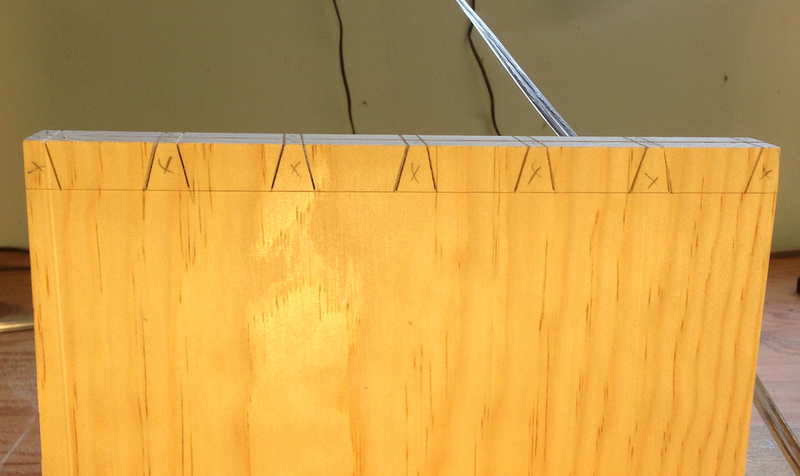 I did the “140 trick” — planing a shallow rabbet in the ends of the tail boards. This gives the board s positive edge to register against the pin board when transferring the location of the tails. It worked really well. 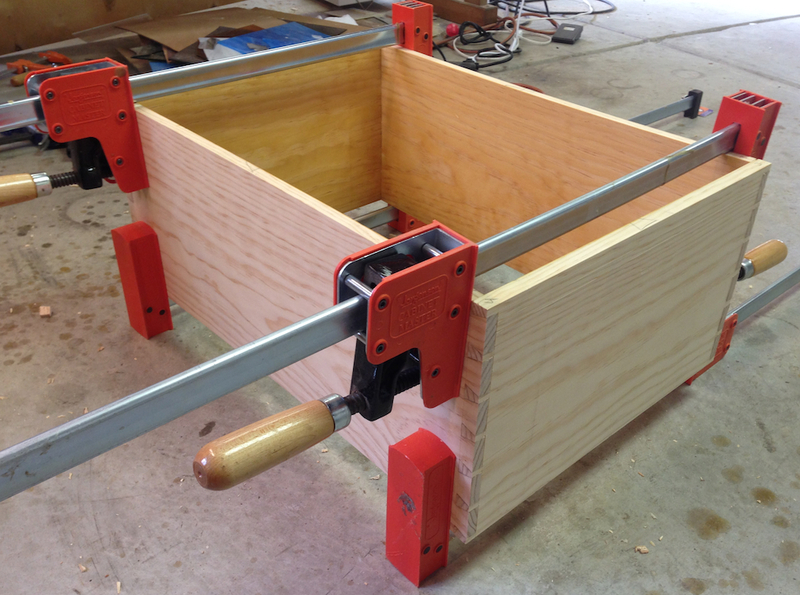 I think my next project needs to be a Moxon vise, it would really help with dovetailing wide boards. It’s probably not clear in the pictures, but I ganged the two sides together and cut the tails on both boards at once. The rabbet is on the inside faces of these boards, so you can’t see it. Transferring the tails was simple since I had a nice clean rabbet to align the boards. I had some small issues with the stability of the pin board. It is slightly cupped, and not well supported on the right side (and it flexes). 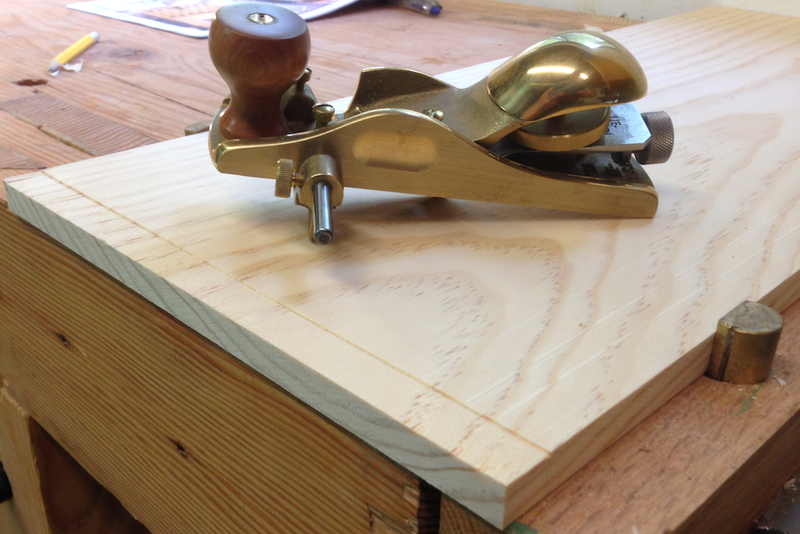 This is why I’m eager to build a Moxon vise, that will totally solve this sort of problem. 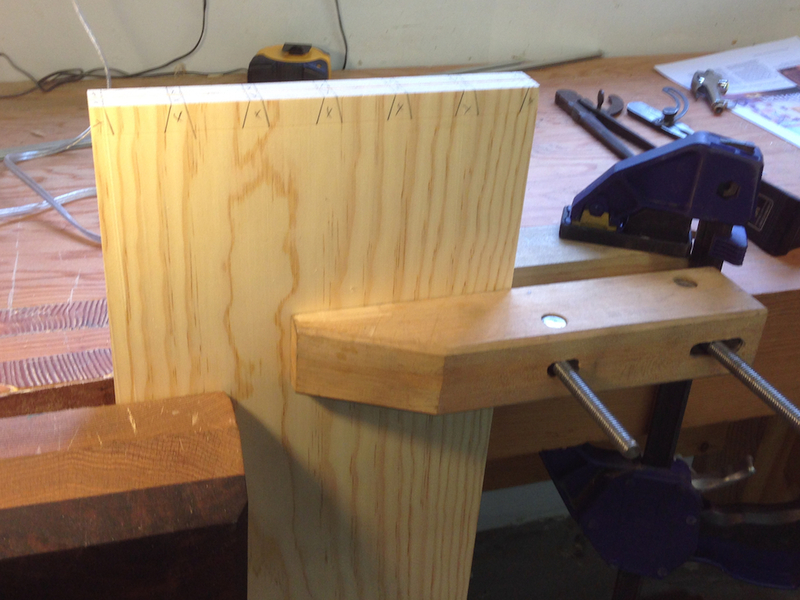 I dry fit all of the joints as I chopped them, then I dry fit the entire carcase and checked it for square. Overall, I’m pretty happy with the dovetails on this. I had a few small issues. Unfortunately, none of the will show in the finished cabinet, they get covered with battens to make it look like a crate. Doh! You beat me to this one. I wanna build this one but .. at the moment .. I don’t have wall space for it. Thanks M. I made the egg crate this afternoon, but I split two of the boards assembling it. Round two tomorrow. Nice job Joe. You beat me to it as well. Are you going to add room in front of the door for hammers etc as suggested in the article? Will you forge your own hardware for the doors? No, and no. Just a straightforward build. I thought about that, but I have plenty of space in my tool cabinet for tools. You are farther along than am I! I’ll still probably finish it after everyone else though! I have this one on the list also. I’ll be watching yours to see if there are any changes I was to make..